Our product “Hemp Bread Basket – Spica” is featured on the cuisine magazine [Ryori Tsushin] June 2017. 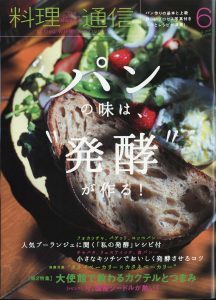 The special feature of this issue is “The taste of bread is made by fermentation “! Basic process of making bread and detailed process picture of advanced level. Tips and recipes are packed. If you are interested, please check it!